A quick gluten free grab and go breakfast! Whisk eggs, milk, salt, and pepper in a bowl. Spray an 8x8 square pan with nonstick, then pour eggs in. Bake for 20-25 minutes. After baking, turn egg sheet out onto a cutting board, and use a circular cutter to make circles. (I used a mason jar lid). 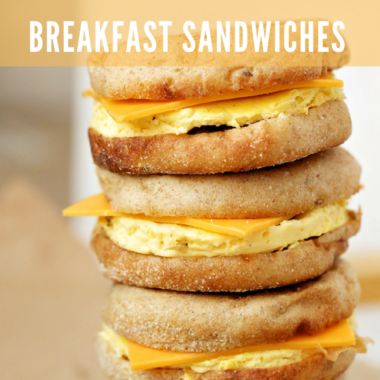 Build your sandwiches: Bread, egg, cheese, bread. Wrap in plastic and freeze.